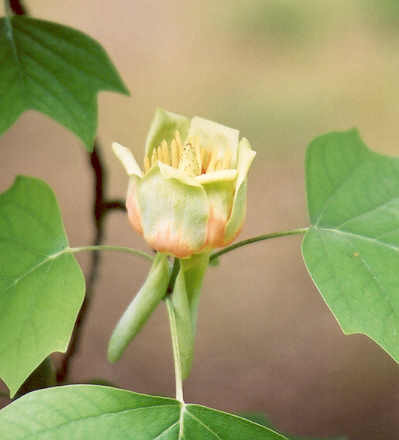 A few miles to the east of Zutphen this splendid tree is to be found: its a Tulip-tree, with the mellifluous botanical name Liriodendron tulipifera, wich has its origin in the Eastern United States of America. In the USA it is the tallest of all hardwoods and can attain a height of 54 m, 179 feet. Our regional giant is not that tall, it is 28 m ( 92 feet), but it is the biggest of Holland in circumference: 6,7 m (22 feet) and seems to be planted around 1830. 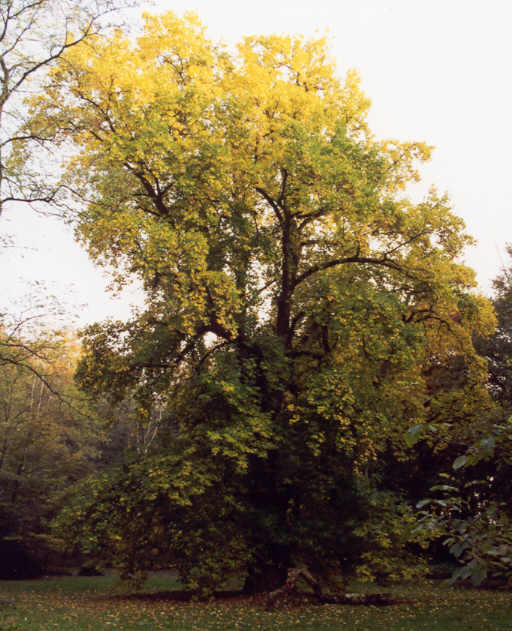 The tallest Tulip-tree of Holland can be seen in Arnhem. 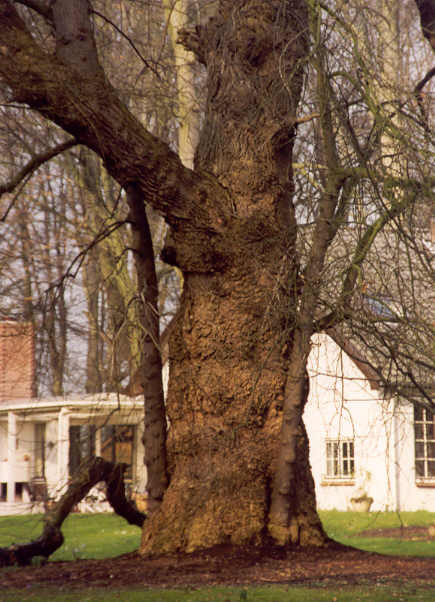 The Tulip-Tree has a characteristic rough bark and in this case like some Lime-trees, new secundairy stems. The name this tree got from the many greenish-yellow tulip-like flowers, wich are not very conspicious high upon the tree between the foliage. 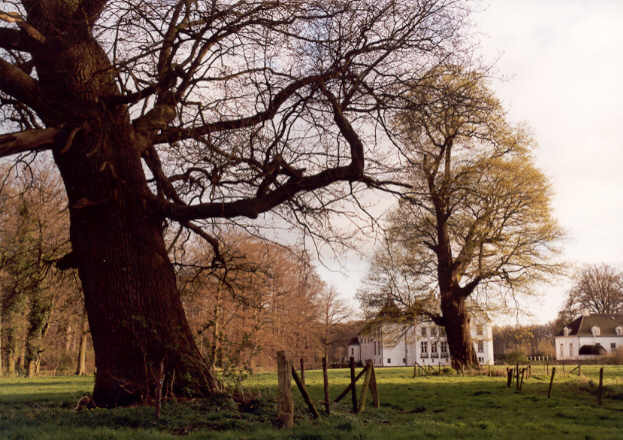 Very near to Zutphen, on the Estate of 'Het Velde', till august 2000 stood two big old oaks, both with a girth of around 6 metre, (20 feet) and with rough, storm-stricken crowns. I called them Ka�n and Abel, because to me there was something dramatic in the atmosfere around them. Here you see Abel from nearby, with his dangerously inclining trunk standing in the swampy soil. The giant Abel felled, not as it seems here by me, but by a moderate summer-storm: oaks are wellknown for their deep rooting and their storm-steadines. In this case the swampy soil with a high groundwatertable made deep-rooting impossible. The tree was in full leaf and because of the inclining, its own weight of over 20 tons became fatal for the tree. 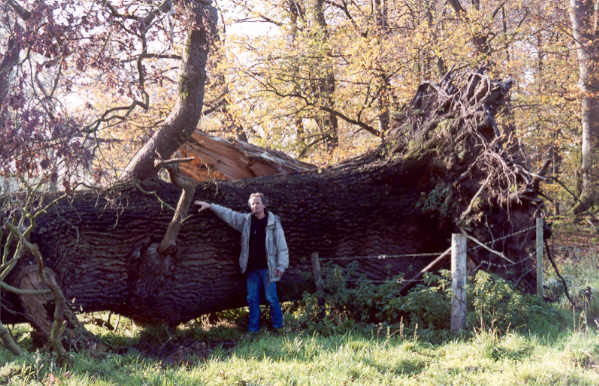 In januari 2001 the tree has been removed and I have been able to count the tree-rings: it was 280 years old, offering good opportunity for comparison with other, still standing oaks.